I miss the days when radio was live and local around the clock. I miss the thrill of hearing my favourite deejays talk up a vocal. I miss the anticipation I used to get when a new deejay came to town, or the feeling of nostalgia when an old one left. I miss the contests, the promotions, the jingles. I miss the days when stations served their communities, and proudly so. Most of all I miss the excitement, the magic, the fun that was radio. Thankfully, we can hear that great radio again, though those little miracles known as airchecks. At Rock Radio Scrapbook, Canada's Aircheck Archive, we have hundreds of them, all free for the clicking. I'm your curator, Dale Patterson, and I want to let you hear radio the way it used to be. Who am I? Well, I'm a journalist based in the Toronto area. I've had the pleasure in participating in radio at many levels - as a broadcaster (at CING-FM Burlington, Ont. (aircheck in Real Audio here and MP3 here), CFMU Hamilton, Ont. (aircheck in Real Audio here and MP3 here), as an operator (at CKFH Toronto), as a editor-reporter (35 years at The Canadian Press/Broadcast News), as a historian (Rock Radio Scrapbook), as a DXer (former member of the National Radio Club with nearly 500 AM catches and over 200 FM catches) and as a collector of airchecks, books and radio memorabilia. Let's face it, I love radio! 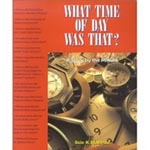 I've had two books published - What Time of Day Was That? from Fitzhenry and Whiteside Publishers and Fifteen Minutes of Fame from Red Deer Press. A more detailed biography of your curator can be found here. There's something special about radio - it's immediate, it involves real people and there is a certain air of mystery to it - you have to use your imagination. With the trend to today's cookie-cutter, predictable radio, I believe it's important to keep the legacy of the great radio of the past alive. That's what this page is about. This web site is dedicated to radio history, with emphasis on the top 40 era. We have plenty of airchecks, written history and lists. Every Sunday, a new aircheck is added in the Aircheck of the Week feature. Now and then, we get recognized, as the CBC's Definitely Not The Opera did in May, 2005 (Real Audio) and MP3 and Doug Thompson did in Broadcast Dialogue in February, 2008. I welcome your contributions to the history sections of this site. If you wish to donate an aircheck, please e-mail and we will make arrangements. All contributors are given credit on the page if they wish. I generally avoid posting airchecks that are on other radio sites; there's no sense in duplication and there is plenty to choose from anyway. The strength of Rock Radio Scrapbook is in its contributors. The following people have contributed information and advice that has greatly helped the development of this web site since we first went on-line October 29, 1996. Johnny Williams *Johnny gave us our first link! If I have left you out, I'm sorry for the oversight. Please let me know and I'll add you to the list!